Last Thursday, I arrived at a tiny and rather musty church hall at 6:15am, expecting to have a fairly quiet day. I’d brought a couple of books along – and I was even mildly concerned I’d manage to finish them both. As we tied signs to fences, posted official notices and erected the rather wobbly wooden polling booths we noticed people were already outside, waiting for 7am to arrive. We let them in, testing out on these first few voters the patter we’d need to use many hundreds of times during the day to explain the multiple ballots. The tide of voters didn’t stop from that moment on. It slowed to a trickle a little after the school run, but soon picked up as the pensioners strolled over from the nearby Sheltered Dwellings. It calmed a little around lunchtime, but then surged once school finished. During the early evening, we had a constant queue of mostly good-natured people. We also saw a lot of first-time voters, eager but nervous, needing explanation – and terrified of doing it all wrong. Simply put, it was one of the most inspiring days I’ve spent working in a very long time indeed. Seeing, and later - as I tried to straighten up after almost fifteen hours of sitting over ballot papers and Corresponding Number Lists - feeling democracy in action is a rare and rather special thing to experience. On the way home, I got the first inkling of an even more surprising outcome via text message. The Exit Poll was wildly different to the previous predictions. Throughout the campaign, the two major parties’ lines had bounced along the middle of the graph, mirroring each other’s miniscule peaks and tiny troughs almost exactly – but now they’d separated markedly and a Conservative majority seemed possible - almost likely in fact. I sped up my walk home – a late night of amateur psephology ahead, wondering whether we’d get any of those “Portillo” moments when a top flight politician has to stand, ungainly and stoic, while someone else gets the cheer and the chance to address the audience. I’ve always loved election night. The rest is now recent history. And the thing is, I voted Conservative. I don’t need to justify my vote to you – or indeed to anyone – because that’s one of the wonderful things about Britain. While there might be numerous flaws in the practicalities of our democracy – and even someone who supports a major party can see that, I promise – it is still a functional democracy. We generally tolerate others without too much concern about their political orientation and it’s still considered extremely impolite to pursue a discussion of politics which is unwanted. That frustrated me as an idealistically young reform-minded Labour voter of course, and it has been equally frustrating at times as a world-weary Conservative voter trying to stave off Sir Robert Peel’s “perpetual vortex of change” while UKIP appeared to be plumbing the utmost depths in their selection processes for candidates. Sometimes you want to shake people, to yell at them and ask them what on earth they’re thinking. But you don’t. We’re British, for goodness sake. Friday dawned with an utterly unexpected outcome. One which of course, I was happy with. Keen to see what the world was saying, I naturally turned to the internet. Now, I’m very cautious about what I post about politics. I have a job which is not restricted, but which is close enough to politics to make it much easier to avoid too much talk about it in public. I also know that many of my friends don’t agree with my views on these matters. I made special exception for mentioning some of the more appalling UKIP gaffes – as I’ve written before their policies were a fundamental threat to my family life, so I make no apology for pointing out these flaws. I abhor the racism and isolationism that party engenders and I wanted their unpleasant underbelly exposed so that people could make up their own minds. Generally speaking though, it wouldn’t have been easy to discern how I felt about the new government. But a little after lunch, as David Cameron made his way to Buckingham Palace, the temperature on Social Media began to change. People I considered generally reasonable and liked a great deal despite having rather different views, began to use some of the most ugly terms to refer to people because of how they’d exercised their vote. Notably, many of these terms played on outdated and archaic notions of mental illness and learning disability – “moron”, “retard”, “imbecile”, “brain dead”, “mong” – I could go on, but you no doubt get the picture. The idea that the electorate was somehow mentally unstable became something of a meme during the afternoon. I found it profoundly distressing to see some of my most liberal-minded friends who would normally – and rightly - rise up in anger should someone use those words, posting and sharing intemperate articles which did exactly that. I am passionate about issues around mental health and disability, so I posted my own concerns – in as unpartisan a way I could – because it felt important to draw a line and remind people they were talking about ten million people who’d had the same right and responsibility in voting that they had, and using terms they’d normally reject outright to do so. The mechanics of disappointment are strange and unpredictable. We’ve all felt them. I felt them when I voted for the first time in 1992 in very similar circumstances to this, and I remember feeling powerless, sad and frustrated and having little in the way of an outlet for these feelings. Had Facebook and Twitter existed then, I like to think I’d have avoided being quite as vicious – but I’ll never know of course. I know that if I had succumbed, I’d feel pretty foolish and embarrassed afterwards though. As Friday wore on, and the realisation dawned on people that this wasn’t a dream – good or bad – I noticed a trend to share articles about things the nascent government had “already done”. By about 3pm it seemed that Cameron – despite not having a Cabinet or a Commons to make any policy had cracked down on support for disabled workers, repealed the foxhunting ban and cut the tax rate for his rich cronies. Closer examination of these articles showed publication dates in 2010 or 2011, or turned up consultation documents prepared by the departments of government but not even nearly on the statue books. What this ill-informed trawling did though was to further raise the temperature of debate – and I fear that those very first-time voters who’d shuffled into the Polling Station, nervous but inspired to vote, were being drawn most deeply into the brewing storm. One of the stranger things about Social Media is how it allows people to edit themselves into a bubble of people who think almost exactly the same way as they do themselves. To narrow their experience of alternative narratives to the point it becomes simple to just discard connections which don't match the pattern. Seeing that working in real time was dizzying and unpleasant. By Saturday evening, after a pretty awful day visiting a very unwell relative, I was feeling particularly raw-nerved and vulnerable when one of my friends, someone who plays really wonderful music in a band I love very much and who I’ve written about and travelled miles to see in their native Glasgow, sent me a message. To paraphrase it said “Please delete our songs or throw away the CDs. We don’t need the support of Tory Scum like you”. 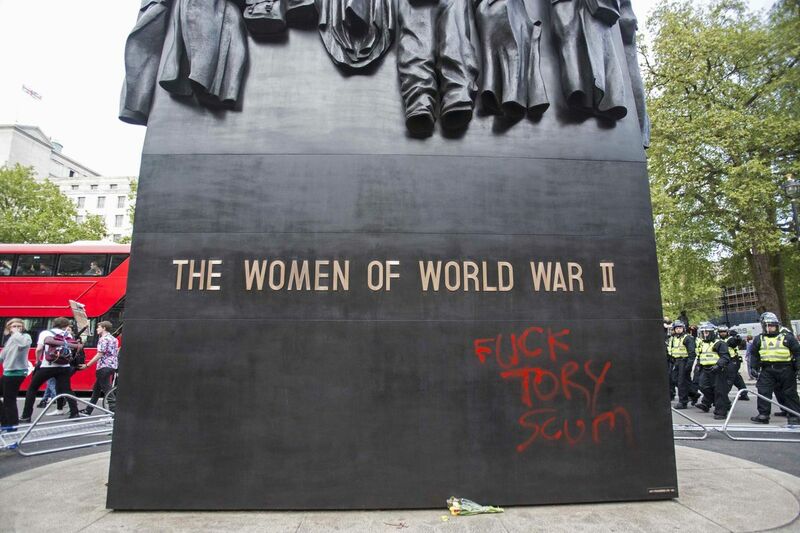 Almost simultaneously that same phrase “Tory Scum” was being daubed on the Women in World War II memorial on Whitehall. There was also a growing Twitter campaign suggesting that people should use violence against “all Tories and their supporters” wherever they found them. Disappointment had taken an ugly twist. That powerlessness and frustration which I’d struggled to articulate or dispose of in 1992 was finding its outlet in the most ugly and sad of ways. I felt a mixture of fear and revulsion, but I felt the urge mostly to explain to people that even though they now knew how I’d voted, I wasn’t any different to the person who’d blogged about their music, traded stupid puns by email or shared a photograph of a misspelled sign. I wanted to tell them that the world wasn’t ending – it was just changing – and most of all it was everyone’s opportunity and responsibility to remake it and influence the change. I opened the browser intending to write just that, but I read another message from another musical contact who told me his small hand-to-mouth independent label didn’t need the money or support of a “fat fascist wanker”. There were others too, but I decided not to read them. I deactivated my account and went to sleep. So what is this? Special pleading from me? A whine that the playground just got too rough? I don’t think so. This is an expression of concern from those of us caught in the middle-ground. Those of us who thought long and hard about how to vote, and did so on the basis of that consideration. We didn’t necessarily indulge in the public mudslinging of the extremes on either side so you didn’t know our minds, but now our hands are declared we’ve somehow become the target of the anger. Are we really the stupid, sleepwalking wider electorate who can’t be trusted to do the right thing? Let me just remind you that the people suggesting this are liberals, supporters of community and inclusion, those who believe on any normal day that people together are much more powerful than people divided. They may even recall that I share those views despite thinking rather differently about economics. Yet they divide and demonise in the very way that they claim to abhor. Watching this disbelief and disappointment play out has been truly worrying – but there have been some notable exceptions. People who – although they felt confused and hurt - have advocated calm and kindness in the days ahead. I’m thankful for some of those voices today. I also want to reject the idea that I’m against people showing passion for their political views. I am absolutely not. If you want to hear a passionate plea for Welfare Reform because the current complex and divisive system is the very root of the demonization of the poor and disabled, give me a call – I will happily indulge you. At length. Probably for too long. I don’t reject passion or want to crush anti-establishment views and actions. I don’t want to erase those white-hot moments of rising hope or anger – they’re an essential and fundamental part of being human. What I truly want is for people to realise that when you advocate a political view you speak both to and for the polis – that wider body of citizens. You can never hope to speak for them all outside a totalitarian state, but to vilify them or turn them into your enemies is a poor strategy in the long-term if a change in society is what you truly seek.